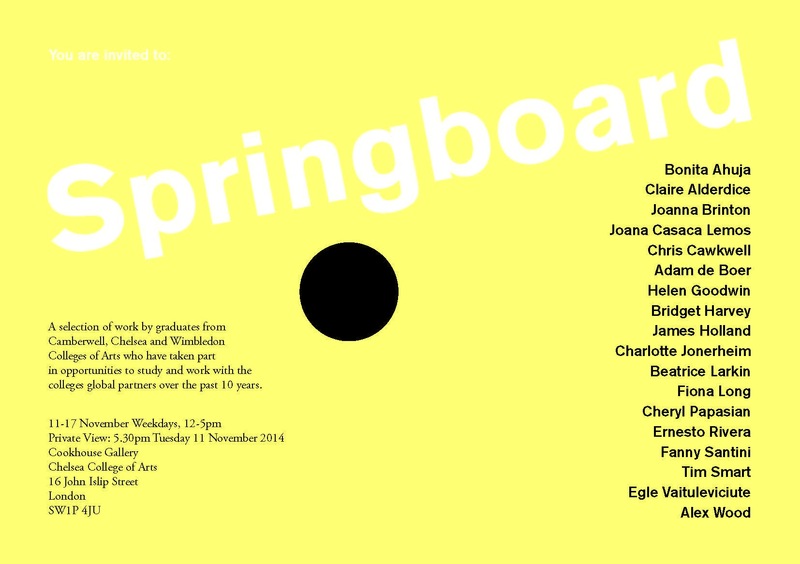 Springboard at The Cookhouse, Chelsea college of arts. 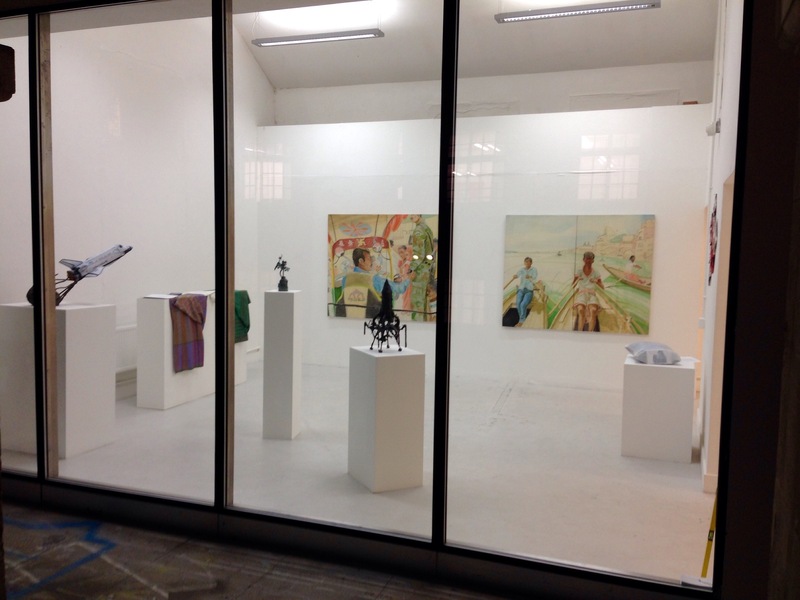 The private view is 11 November at 5.30pm and the exhibition runs until Friday 15 November 11-5pm. 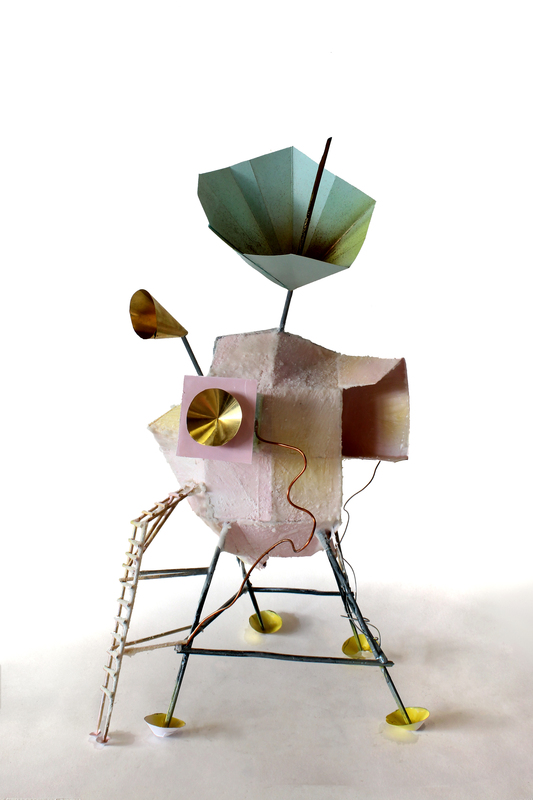 The Dirigibile, Brass and lead, 2014. Private Collection. 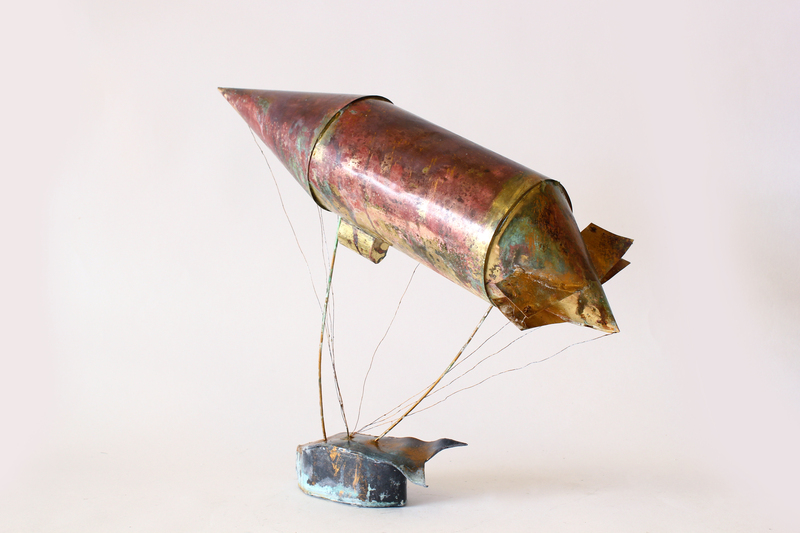 ‘The Dirigible’, Brass and lead, 2014. Private Collection. 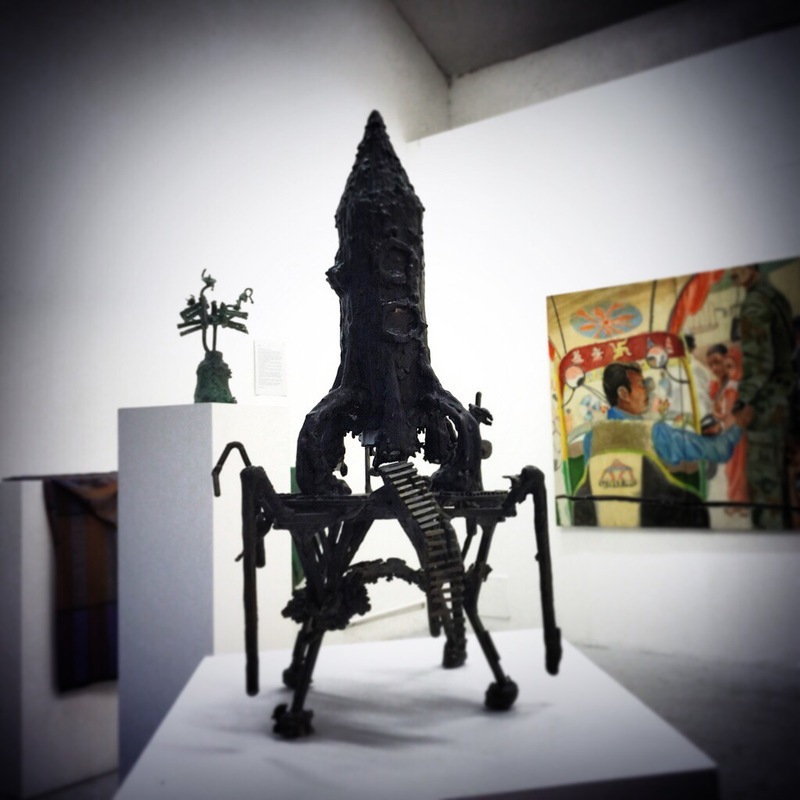 Photographs taken by a professional London based photographer for his forthcoming book on artists and their studios. 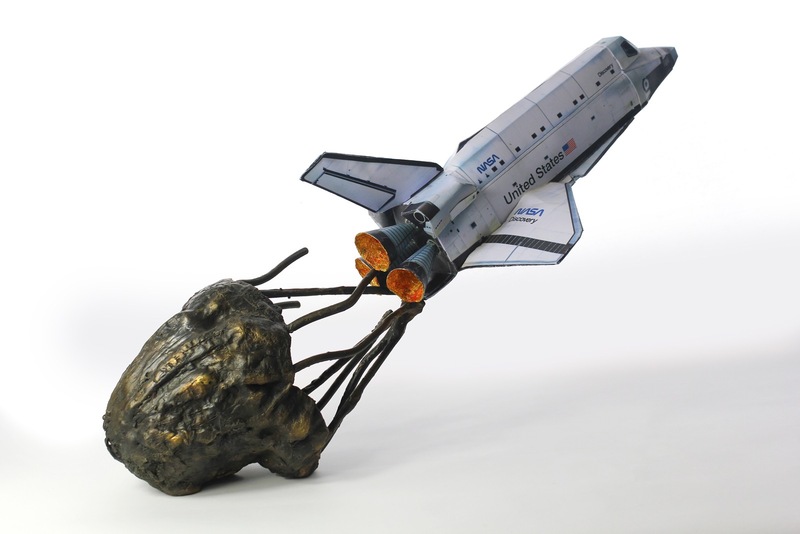 I exhibited some of my new Space Series Bronzes at the launch of a new ArtLyst event at Candid Arts Trust. It was great fun and here are some of the photos from the evening. Michael Petry spoke and there was a performance by Roberto Ekholm too. 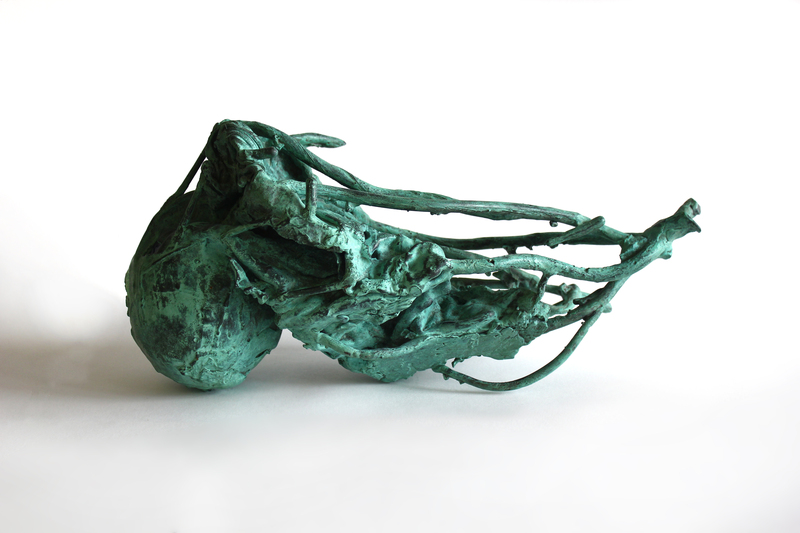 Alex Wood might be the unholy reincarnation of Heath Robinson, for he sets his wild imagination and crazy obsession with flight into the heaviest of artistic materials: BRONZE. 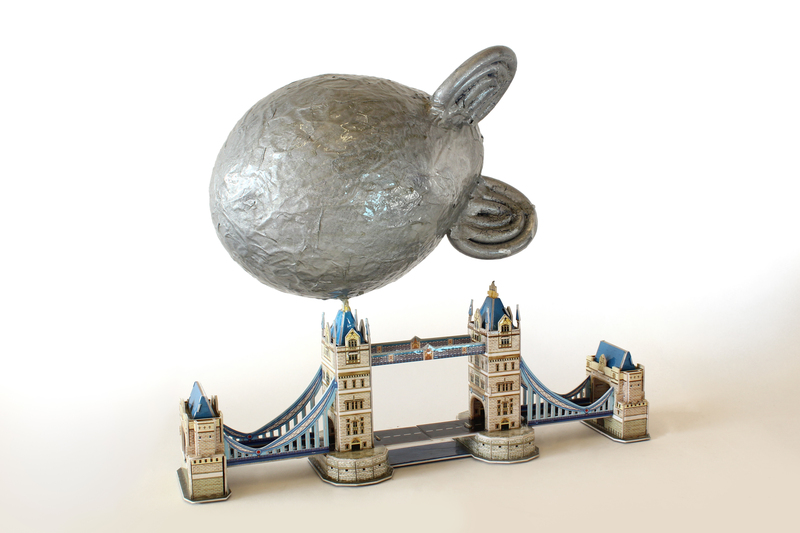 A silvered paper zeppelin crashes into a bronze tower in R101 (sadly the original British R101 crashed on its maiden flight in 1930 killing almost everyone on board), a bronze hot air balloon cannot take off and lift its wicker basket in We Have lift-off! 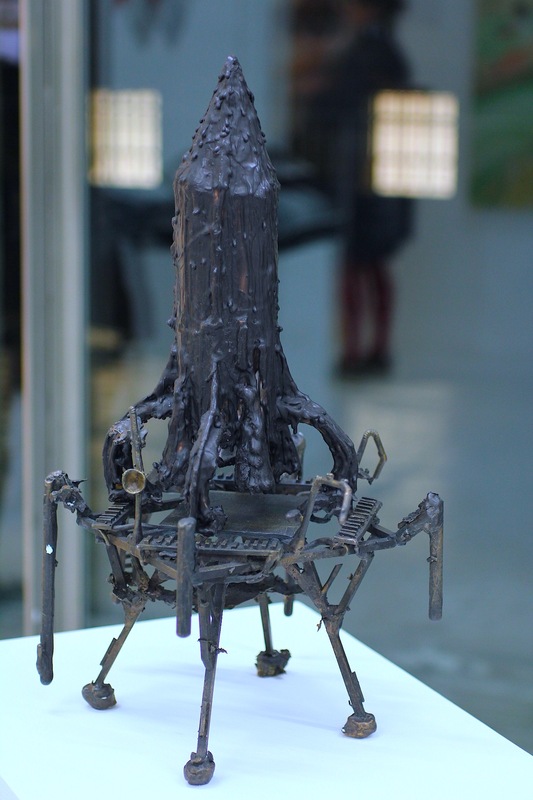 While in a new work Fly Me to the Moon a rather wrecked 1950’s version of what a rocket should be, looks like it could never lift off either. 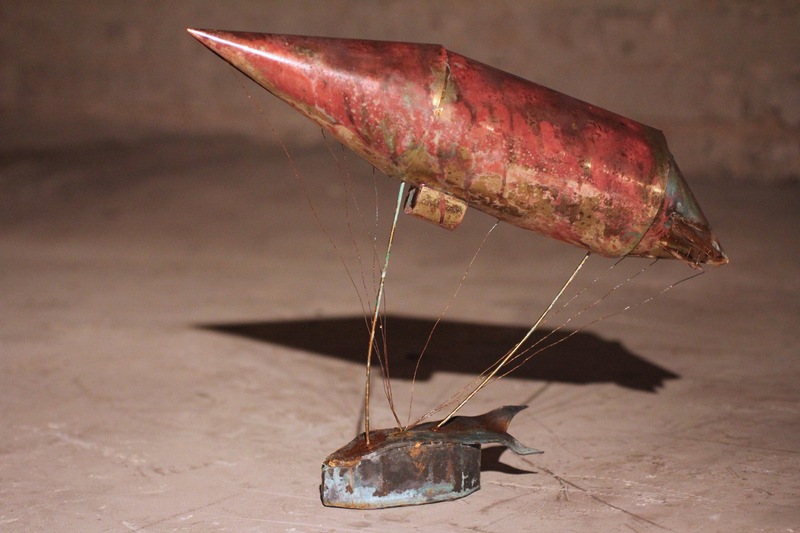 A larger work that deal with flight or the lack of it Taking Off, looks like it came out of someone’s father-in-law’s garden shed. 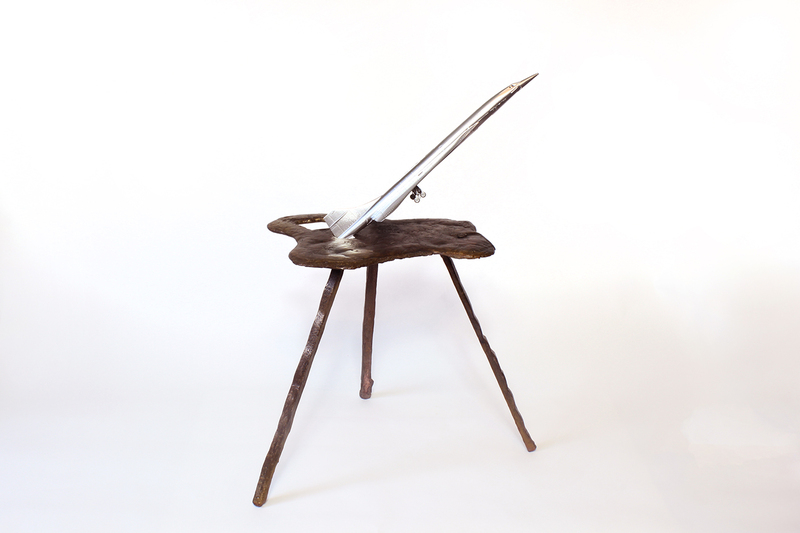 It is made from what appears to be found timber and bicycle wheels but also has bronze elements just to add a bit more visual and historical weight. 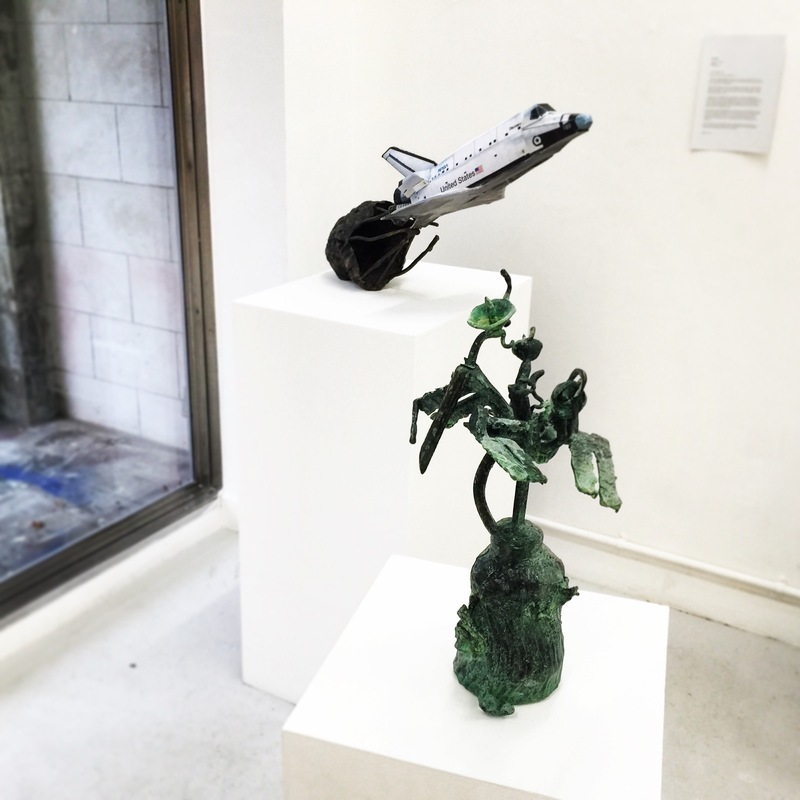 A silver model of Concorde is stuck in a mass of bronze in Mach 2, neither the model or the original are going nowhere and his Ferris Wheel is wonderfully mad, a work his spiritual grandfather would have been proud of – ceramic drinking cups are attached to a motorized bicycle wheel and a mouse could easily topple the complex structure. 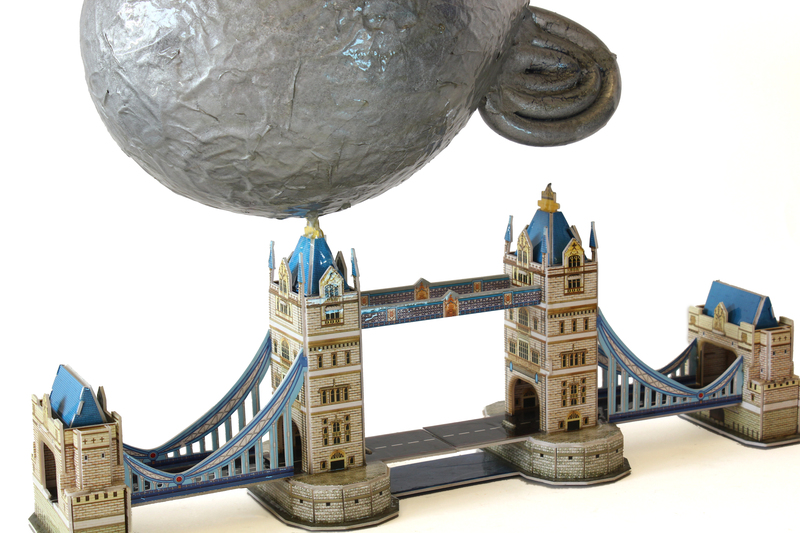 It is the heady joy of these objects that brings a smile to the face of even the dourest viewer. 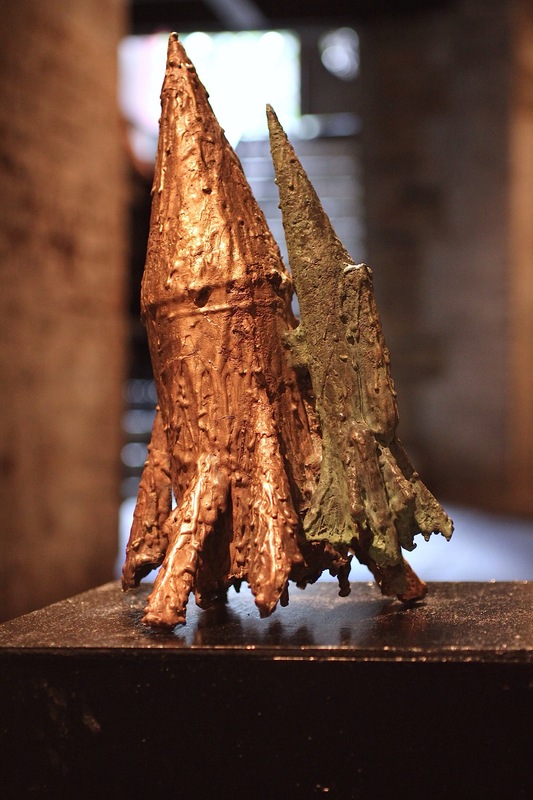 That so many of his works are translated into such a staid material (bronze) makes the viewer realize how considered, how constructed, how sophisticated they are. 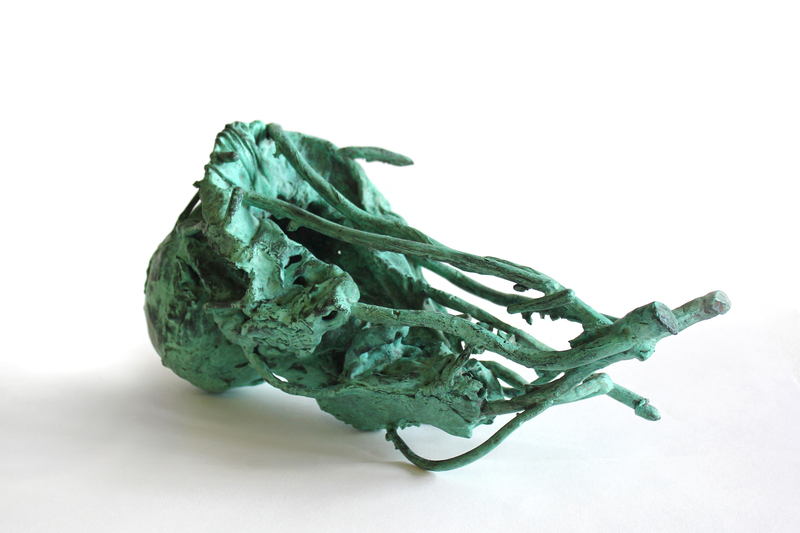 For those unfamiliar with the process, bronze casting is a labor of love and the significant word is labor. 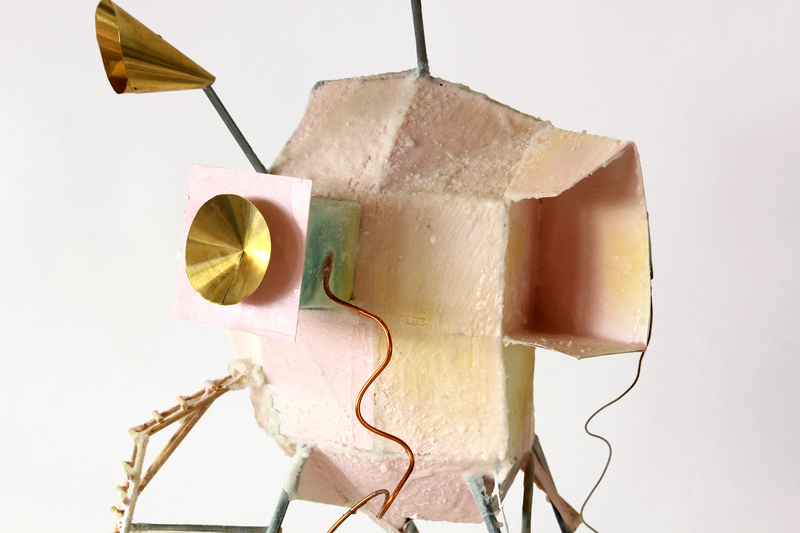 These works at first look thrown together, jokey, but on inspection we see they are much more complex and they have been hard fought struggles to come into being and that makes the smile grow even a bit wider. 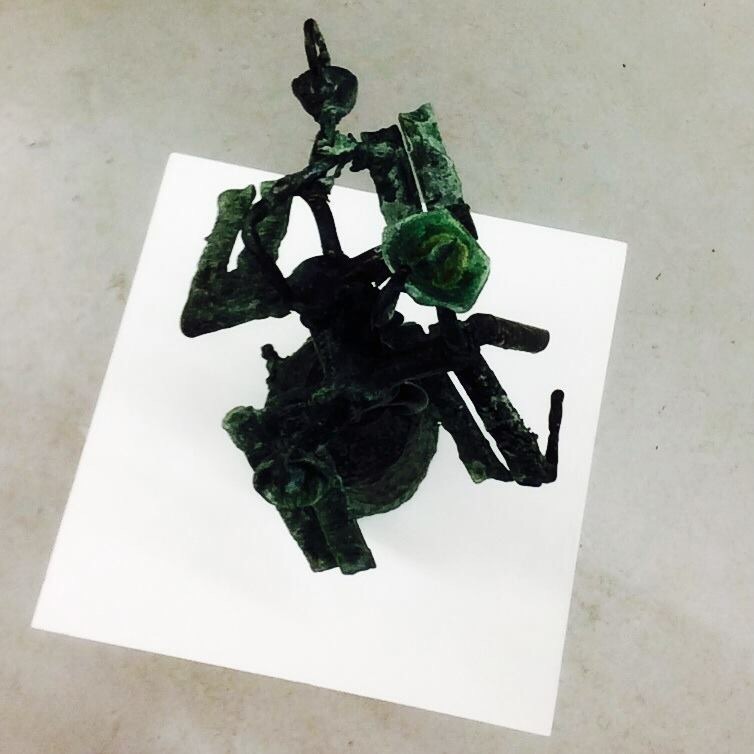 CMYK colour model ceramic works – exploring the relationships in the colours and contrasts which can be created in glazes.